I'm tickled to welcome cat writer and novelist Dusty Rainbolt today. You MUST click on the links to the historical finds she mentions! We couldn't lift the pictures (we both support copyright!) but, really, you have to see the pictures. 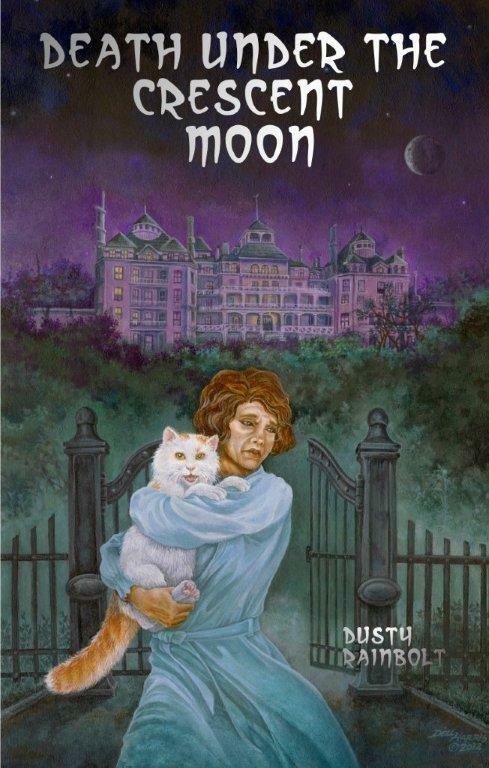 >^..^< Comment on this blog for a chance to win a copy of Dusty Rainbolt’s new paranormal mystery, Death Under the Crescent Moon. Click the kitty >^..^< to watch the ghost video that inspired the book, and read an excerpt below. 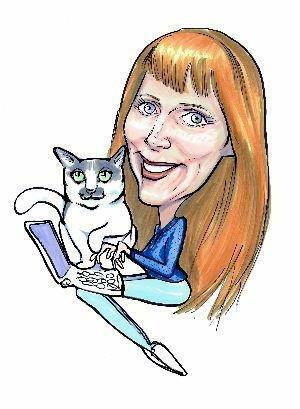 By day I’m a mild mannered pet journalist—AdoptAShelter.com’s editor-in-chief, the author of cat care and behavior books, as well as the writer of countless articles and columns. At night my alter ego emerges: the novelist. As an aspiring author I visualized my future similar to the scenes in old black and white movies. I sit before my Olivetti typewriter working late into the night. The rhythmic tapping mingles with the sweet, sustained notes of Mozart streaming from a single monophonic speaker. I sip chilled Dr Pepper™ from a crystal champagne glass. Beside the typewriter, Webster and Roget await my beckon. My dog, an obedient Doberman, rests silently under the desk so as not to interrupt on my concentration. As the night progresses, my novel takes shape. By the time the sun peeks over the horizon, I type, “The End”. It’s brilliant! I AM A GENIUS! But after decades of working as a professional writer, I have to admit the reality plays out much differently than my youthful fantasy. The loyal canine turns out to be a species-confused crested/terrier-mix (who can discretely let herself outside, but for the all the bully sticks in Texas can’t figure out how to get back inside using that same door.) The thesaurus and the dictionary have migrated to my hard drive, after which an entire litter of rambunctious foster kittens we call the Mongol Horde (not to be confused with a Mongrel Hoard) have seized the dictionary’s hallowed location. Those six week-old marauders had not a whit of reverence for their sleeping spot. But since they established their Occupy Reference movement, little Genghis and his brother Kublai took on the role of shorthaired spellcheckers. Like an advancing colony of army ants, nothing in their path is safe—not the dog, not our eternally tolerant cats, and least of all my well-researched, painstakingly-composed features. Careening across my keyboard at light speed, the kittens take great pride in inserting paragraphs written in what I can only guess is Klingon. I don’t mind so much the added words, but my life is shortened by years whenever they manage to delete a huge block of text. My body also suffers at their paws. A collection of claw-inspired dot and dash Morse code characters stretch up my legs like an illuminated manuscript—possibly also in Klingon. Over the last 25 years (that sounds so much better than “quarter of a century”) I’ve rescued, fostered and rehomed over 1000 surviving cats and kittens. Each success, each failure has taught me something I can share in writing, something that can help cats and rescuers across this planet. Bloody legs and deleted passages are a small price to pay for that privilege. Sam came to us on the day he was born. Kublai came to me. He was only three weeks old, and he struggled for each breath. 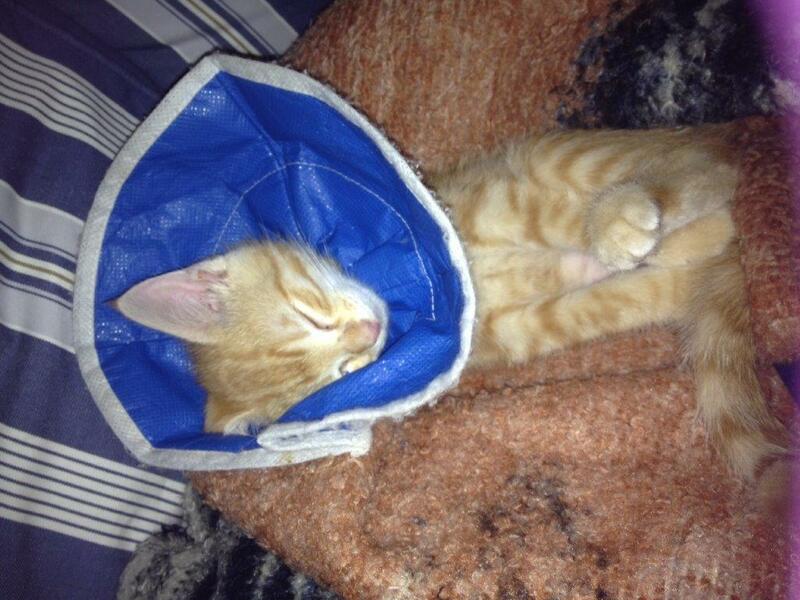 My vet gave him little chance of surviving. But that little warrior knows no surrender. After two months he’s still enduring nebulizer treatments and antibiotics. 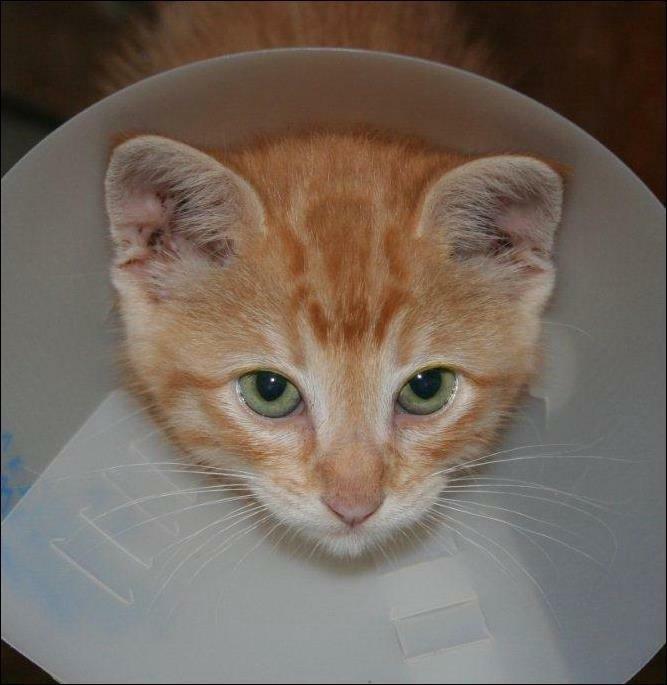 But when he rearranges the words I’d spent hours perfecting, or climbs my leg with hypodermic claws, I celebrate the near lifeless kitten transforming into a creature capable of causing so much havoc. Cat-associated literary catastrophes are not a new phenomenon. Most likely, cats have been inspiring and hindering writers since the pharaohs. While writers’ tools have changed from chisel to ink to keyboard, the outcome hasn’t. Cats still keep sticking their paws in our business. Davy Jones hates his ecollar. In the 15th century, when it cost a great deal in time and money to hand write even a single page, the scribe simply accepted the blemishes and moved on. So here I am. I’m sitting on my sofa with my laptop resting on my knees. Scratches decorate my legs like streets on a roadmap. My fingers fly as I rush to finish an article for June, Adopt-A-Shelter-Cat Month. I hope if there’s a new cat in your future, you’ll adopt a shelter kitty, maybe even one of my little sweeties. Remember, adopt from an animal shelter and you save a life. YOU’RE A HERO! Whether you’re artist, musician, engineer or writer, everyone needs a furry museeeeeeeeasdddddddddddddca etwgaw. Below her, a gray fog settled into the valley. The mist slowly grew heavier and denser, descending into the basin’s depths. Slowly, misty tentacles of fog extended, swallowing the town lights. Eventually the fog reached her and rose up through the guardrail as if someone was trying to cover her in a burial shroud. Funny, her old film producers would have killed to duplicate this atmosphere.Norman Baker had promised her a new beginning, a cancer cure. Eva looked out over the vista wondering, is this the Valley of the Shadow of Death, or is it a sign that I have nothing to fear? The wind from the north picked up and the fog temporarily receded. She turned her wedding ring, still stubbornly displayed on her left hand. Alone...Eva Dupree, the once-famous darling of the silent screen, alone and under attack by a monster that, unlike those in her films, could not be banished by a director yelling “Cut!” She shut herself away from the world—except for her sharp-tongued maid, Rose, and Edgar’s cat, Ivan the Terrible. Without warning, the hair on her neck lifted and a glacier of goose bumps spread across her arms—a deeper cold than mere weather. This chill sank all the way to her bones. She closed her chenille robe and knotted the tie. An icy hand brushed Eva’s shoulder. Alarmed, Eva dropped the magazine into her lap and whipped her head around. Only a few feet away stood a young woman. The woman—a girl really, surely no more than sixteen—was wearing a shapeless white dressing gown and stared at Eva. Long, dark hair tumbled about her shoulders. She, too, had been crying. With all her time in and out of hospitals, Eva had learned they weren’t just lonely places for her alone. That explained why at any time of the day or night one could find patients or even visitors roaming the halls looking for escape or comfort. Even Eva was out on the balcony in search of solace—and perhaps this young patient simply needed to clear her mind of the pharmaceutical fog of painkillers. There was a learning curve to facing mortality as Eva was beginning to understand. The teenager didn’t say anything; she just looked back at the older woman with eyes so sad, they broke Eva’s heart. The long silence grew more awkward. Eva finally decided the girl was too heavily medicated to respond—the poor thing probably didn’t even know where she was. “No harm done.” Eva pointed at a chair next to hers. “You can sit here with me for a while if you like.” She laughed nervously. “I know it sounds crazy, but when I looked up just now and saw you there, I was sure I’d seen a ghost.” Eva’s brittle laugh faded into the wind. The girl moved closer to the guardrail. She stared down for a moment and then gazed over at Eva. Suddenly her expression changed. She looked around as if she expected someone to storm onto the deck. Suddenly, Eva feared for the girl’s safety. “Are you all right?” Eva stood up from the lounge chair and took a step toward her. The girl placed her hands on the railing. She cocked her head, staring at the ground four stories below. This girl shifted her unblinking gaze from the ground to Eva. The girl’s eyes met Eva’s for a final moment. She reached out her pale, delicate hand, a sad ethereal invitation, and said in a wispy voice, “Why don’t you jump?” Then she swung her legs over the railing. Eva lunged toward the rail, stretching for the girl’s hand. At that moment, the girl released her hold. Eva grabbed only a handful of air while the girl plummeted silently toward the earth. About the Book: Eva Dupree used to have a fairytale life. Ten years ago she was Victim Vixen of 1920s horror movies and married to a rich handsome movie producer. Today she is living through real horror: her husband has died suddenly, she’s been diagnosed with a terminal disease, and she’s stuck taking care of her late husband’s cat. Can it get any worse? Yes! Seeking a cure at the Baker Hospital and Health Resort in Eureka Springs, Arkansas, she quickly learns that past patients never checked out. Eva begins to see and hear things she can’t explain. Cure or not, after a male voice threatens, “I want you”, Eva decides to leave. But hospital owner, Norman Baker, won’t let her leave. Will Eva end up like the restless spirits of patients past, trapped forever? Death Under the Crescent Moon is available in trade paperback from Yard Dog Press for only $14. It’s also available for Kindle and Nook for only $4.99. A bargain! Dusty Rainbolt, ACCBC, is the editor-in-chief of www.adoptashelter.com (an online cash rewards mall benefiting animal charities) and vice president of Cat Writers’ Association. Her paranormal mystery Death Under the Crescent Moon was released in early 2013, as was her anthology, The Mystical Cat. 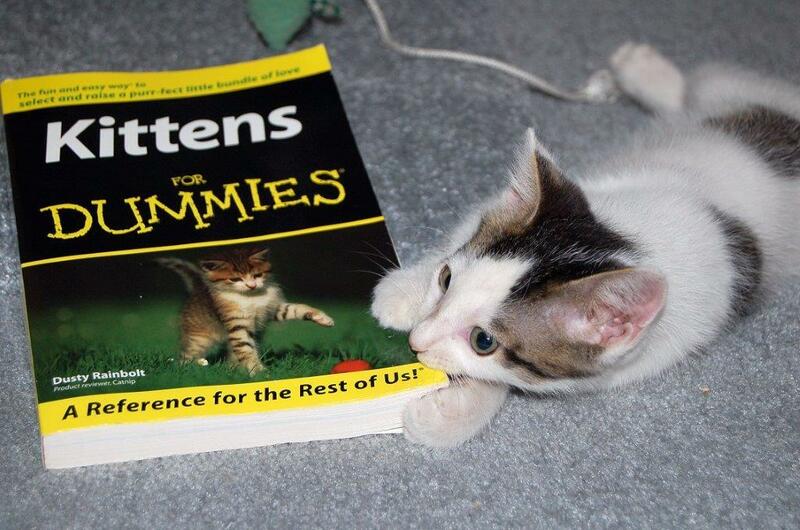 She’s the author of Kittens for Dummies, Cat Wrangling Made Easy: Maintaining Peace & Sanity in Your Multicat Home, Ghost Cats: Human Encounters with Feline Spirits, the humorous science fiction novel, All the Marbles, as well as a coauthor of the successful Four Redheads of the Apocalypse series. Hi Dusty! I enjoyed your post soooo much...Sheila knows me, books and cats are my life. And my kitties are *always* rescues. Death Under the Crescent Moon sounds absolutely delightful...can't wait to read it!!! Thanks. Books and kitties. It doesn't get any better than that, unless you're sipping a nice Zeller Schwartzkatz. Books and cats. It doesn't get any better than that, unless you're also sipping on a nice Zeller Schwartzkatz. Cats and books. It just doesn't get any better than that! Unless you're sipping a nice Zeller Schwartzkatz while you're reading. Crescent Moon sounds like a great read. Our littlest rescue kitten is always changing the settings on my laptop. And, he actually caused a few texting typos (teething is tough!). Oh no! Changing settings. That's way worse than deleting text. My sympathy. My cats have discovered two ways to aggravate me when I'm writing: stand in front of the computer monitor, or beg to come in or go through the outside door every five minutes. Boots has taken oven the wicker basket on my desk where I used to keep papers. Now it's her curl-up spot. But at night they want to cuddle in bed and it's hard to stay mad at them. Good luck with your book! Sounds like GE invisible cat would solve that monitor issue. My daughter-in-law's cat proved partial to my keyboard with some upsetting results! Congrats on your novel publication. Shame you can't have the kitty's work translated. I wonder what he's trying to tell you? Thanks. I back up my computer regularly...just in case. Dusty wanted me to let you know that she's on the road, but will check in soon! Hi Everyone. It's been great getting to know yall. I'm happy to announce that Jacqueline Seewald is the winner of a copy of Death Under the Crescent Moon. Jacqueline, please friend me on Facebook and send me your mailing address.